Property maintenance services are available to keep any type of property in top condition for any type of Saskatoon weather and season. We offer lawn care, window washing, snow removal, and so much more! Whether you own an apartment building or a large property that requires a little extra help, contact the professionals at Pioneer Landscaping today. Rejuvenate building exteriors and clean up pathways with our commercial pressure washing services. Make life brighter both outside and inside of your home with our window washing services! Available for both exterior and interior windows. Help your eavestroughs flow easily and prevent further water issues by having them cleared up yearly. We also perform eavestrough repairs if you experience any type of damage from strong winds or rain. We offer snow clearing, snow hauling, sanding, and ice control so you can be sure that all areas are clear and safe. From commercial lots to residential driveways and walkways, we take care of snow on all properties. Our weeding services include thorough removal of weeds, as well as preventative methods that include regular maintenance and environmentally friendly weed control products. Flower care includes watering, weeding, and other general maintenance work to keep your flowers flourishing. We also offering planting services if you would like to add to your garden. Our lawn care services include grass cutting, edging, weed control, brush or shrub maintenance, and so much more. Our lawn cutting services are offered to keep your property trim and as healthy as possible. We provide routine cutting to ensure your property maintenance schedule can remain on track. Lawn edging keeps the grass maintained and creates a clean look for your property. 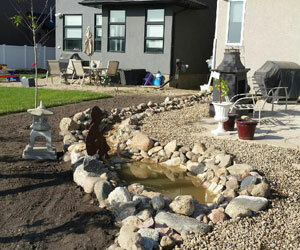 We will make sure all edges are trimmed as needed to prevent overgrowth and other messy appearances. Hauling services are available to transport a wide variety of materials that include soil, rock, mulch, and more. We can also remove unwanted materials from your site to make way for your next project! Pioneer Landscaping is available to plant a variety of grasses, flowers, trees, and many other plants to enhance your green spaces. Whether you would like accent plants or entire flower beds, our team can do it all. Pruning will keep your plants and trees healthy. They will be able to grow more efficiently and will provide a trim, beautiful look. If you do not find what you are looking for in the services above, please contact us. We have a diverse range of skills and equipment. We will do our best to complete the job you need done, or find someone for you who can!